Day 1: April 27/28, 2015. We took the Simcoe County Airport Bus to Toronto International (Pearson) Airport. We flew overnight to Frankfurt am Main Airport in Germany. After a 4-hour stopover, we flew on to Istanbul, arriving just in time to check in to the Intercontinental hotel and have dinner before we fell exhausted into bed..
On our way from the airport to our hotel and over the next two days, we saw some of the city of Istanbul as we drove across the Golden Horn to tour Topkapi Palace, Agia Sophia, the Blue Mosque, and the Grand Bazaar. On the afternoon of April 29, we walked from our hotel through Taksim Gezi Park to Taksim Square, then down to the Bosphorus to see the Dolmabahçe Clock Tower and Palace, then back up the hill to our hotel. With a population of over 15 million people, Istanbul is the largest city in Turkey. 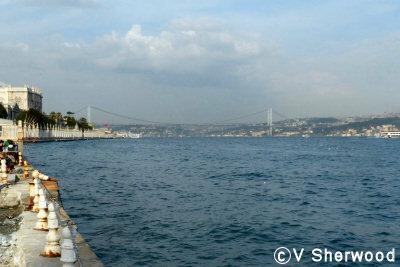 It straddles the Bosphorus, so it is partly in Europe (left in the photo) and partly in Asia (right). The two parts of the city are joined by the Bosphorus Bridge, which is 1.5 km long. The main connectgion between Istanbul Europe and Istanbul Asia is a fleet of ferries which take several million people back and forth across the Bosphorus every day. 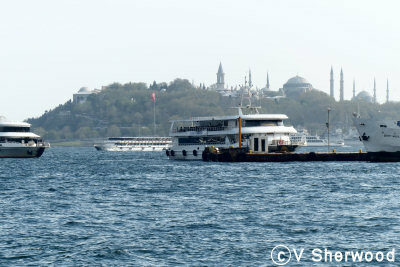 Behind the ferries in the photo you can see Topkapi Palace on the left, Hagia Sophia in the middle and the Blue Mosque on the right. 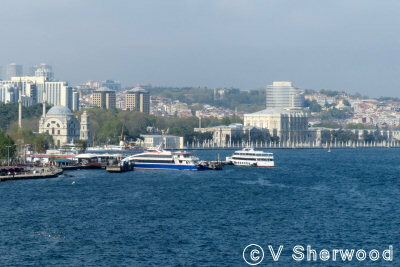 Between Topkapi and the ferries is the mouth of the Golden Horn. There are three major bridges crossing the Golden Horn, one of which also carries the underground. 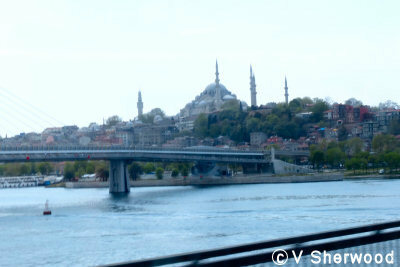 In the background is the Süleymaniye Mosque, the largest mosque in Istanbul. 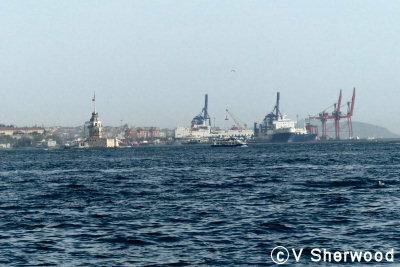 The main cargo docks are on the Asian side of the Bosphorus, across from the Golden Horn. The docks for the passenger ships are on the European side, near the old city with all the tourist attractions. Taksim Gezi Park from Taksim Square. Our hotel is at the other end of the park. There were riots 2 years ago in the square when the city wanted to demolish the park and build more shops. May 1 is a popular time for demonstrations in Taksim Square so we were glad that we were boarding our ship and sailing on April 30. 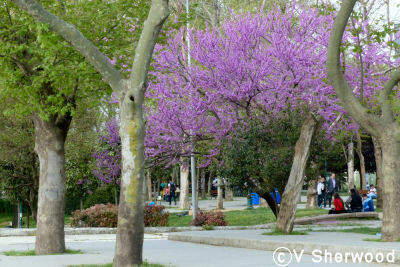 In the afternoon of April 29, we walked from our hotel, through Taksim Gezi Park and down to the Bosphorus. To the right of the Dolmabahçe Mosque is the Clock Tower, build in 1895, and Dolmabahçe Palace. The palace was built between 1843 and 1956 to house the sultan and his family as Topkapi Palace lacked modern conveniences and comforts. From 1856 to 1922, it was the main adminstration centre of the Ottoman Empire.